Five of the eight graduates from the ESQuaReD Lab. 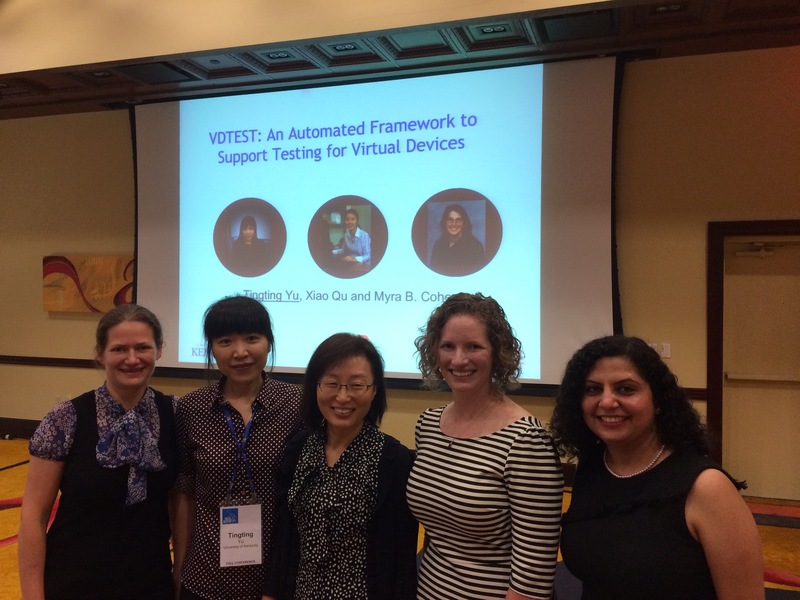 From left to right: Elena Sherman, Tingting Yu, Hyunsook Do, Kathryn Stolee, and Sandeep Kuttal. The University of Nebraska–Lincoln’s ESQuaReD Lab has been ranked in the top five in the world in different assessments of international research in the field of software engineering, with several of its faculty members also placing highly on those lists. But perhaps what’s more impressive is the significant number of outstanding women who have graduated from the program and achieved great success in a predominately male field. Eight women have graduated from the Department of Computer Science and Engineering with Ph.D.s focusing on software engineering, and some have even received multiple degrees from the program. These graduates have gone on to make significant accomplishments early on in their academic and research careers and cite their ESQuaReD Lab experience as the foundation of their success. Hyunsook Do was the first student to graduate from the lab in 2007 after its establishment in 2004. Now an associate professor at the University of North Texas and an NSF CAREER Award recipient, she credits the lab and its members for helping her develop the high standards and strong skills required for a career in research and education. The ESQuaReD Lab, or the Laboratory for Empirically-based Software Quality Research and Development, primarily focuses on software engineering research. Faculty members of the lab are actively involved in the software engineering research community, leading research in foundational program analysis techniques applied to the web, security, robotics, and supercomputing. For many of the graduates, their advisors not only assisted them in their research, but even guided them toward their specific fields of interest. Tingting Yu, who received both her master’s degree and Ph.D. from Nebraska, said the experience and knowledge of her advisors is what initially developed her interest in software testing. Yu is now teaching software testing courses at the University of Kentucky and continuing her research in the field with the support of an NSF CAREER Award she received this year. The opportunity to learn from not only advisors, but multiple faculty members from various research backgrounds provided lab students with a well-rounded learning experience. This was especially true for Madeline Diep, who is now a research scientist at the Fraunhofer Center for Experimental Software Engineering. Not only did the lab’s unique cooperative environment expand learning opportunities for many of the students, but it also helped them build strong relationships with each other. Boise State assistant professor Elena Sherman was one of the first women to graduate from the program with both a master’s and a Ph.D., and said what she valued most about the lab were the professional and personal relationships she developed with fellow female students and still maintains today. That support from fellow students and faculty is what kept NC State assistant professor Kathryn Stolee coming back to the program. She received her bachelor’s, master’s, and Ph.D. from Nebraska. It’s also what brought Suzette Person back to the program after bringing her Ph.D. research to NASA. Having been a part of the program previously as both a lecturer and student, Person understood the program’s commitment to education and student success. Now an associate professor and director of the new undergraduate software engineering program, Person believes there truly is no place like Nebraska.